Asian Games gold medalist Yuka Saso returns to the scene of her latest triumph to challenge the best of LPGA of Taiwan (TLPGA) and the Ladies Philippine Golf Tour (LPGT) as she toughens up the cast in the rich ICTSI Manila Golf Ladies Classic starting today (Wednesday, April 10) at the Manila Golf Club inside the posh Forbes Park. Fresh from her joint third place effort in the historic Augusta National Women’s Amateur at the home of the US Masters last Saturday, the Fil-Japanese will be bringing with her a form and confidence boosted by her five-shot triumph to retain the Philippine Ladies Amateur Open crown last February. The long-hitting 17-year-old Saso also placed second to world No. 1 Sung Hyun Park in the inaugural The Country Club Ladies Invitational last month then flaunted her world class form by rallying from joint 11th with a closing 69 to finish in the top three in Augusta, Georgia. That makes her one of the marked players in the star-studded $100,000 championship with the likes of TLPGA No. 3 Babe Liu, Thai Yupaporn Kawinpakorn, reigning LPGT Order of Merit champion Princess Superal and fellow Symetra Tour campaigners Mia Piccio and Cyna Rodriguez all ready to dish out their best to stop the talented amateur from coming on top in this seventh leg of the LPGT and third stop of the TLPGA sponsored by ICTSI. 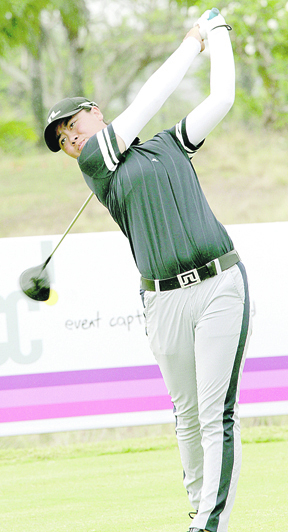 Liu, who placed second in the first LPGT-sanctioned tournament – the Party Golfers Ladies Open – in Taiwan last October, gets the chance to test Saso as they clash in the 10 a.m. flight on No. 1 with Thai veteran Chonlada Chayanun joining the group. A flight ahead are Superal, Lin Tzu-Chi of Taiwan and another Thai Chakansim Khamborn while 2017 LPGT OOM winner Pauline del Rosario tees off at 9:40 a.m. against Taiwanese Chen Meng-Chu and Mina Nakayama of Japan. Mia Piccio is also tipped to get into the early mix as the Symetra Tour veteran slugs it out with Thai Thanuttra Boonraksasat, winner of the last LPGT leg at Southwoods and amateur Chang Tzu-Yi of Taiwan while multi-titled Yupaporn Kawinpakorn launches her drive for a follow-up to her Pradera Verde romp last January against Japan’s Miki Yamashita and Weng Liting of Taiwan at 8:40 a.m., also on the first hole. Taiwan, including last year’s LPGT/TLPGA Midlands leg winner Ching Huang, has 25 players vying for top honors in the event co-sanctioned by TLPGA and the Philippine Golf Tournaments, Inc. and backed by Custom Clubmakers, Meralco, K&G Golf Apparel, BDO, Sharp, KZG, PLDT, Empire Golf and Sports and M.Y. Shokai Technology, Inc., while Thailand, which dominated last year’s LPGT by ruling six of 11 tournaments, has 39 entries in the 93-player field.